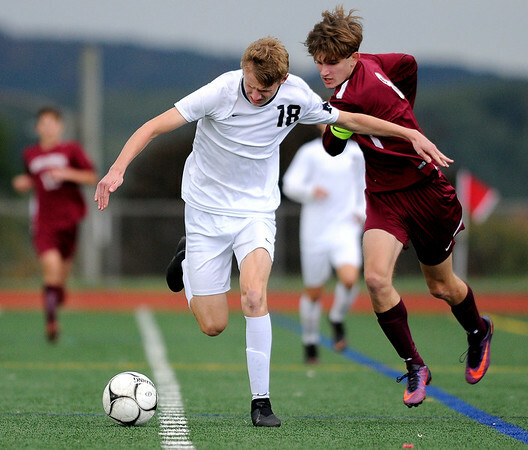 BRISTOL - With under two minutes to go in the overtime period, both the Bristol Central and Newington boys soccer teams were looking for the game-winner. It was David Bowes who delivered the deciding goal for the Rams, his second of the game, with 1:31 remaining in overtime off an assist from Yanni Koci resulting in Bristol Central’s 2-1 victory on a frigid Wednesday afternoon. It was the third straight win for the Rams (6-4-1) and just the second loss for Newington (5-2-3). Bowes was the player to put the Rams on top first with a goal 11:52 minutes into the first half off of an assist from Diego Naranjo. Just minutes later Newington’s Hermish Adarkwah put in the equalizer to tie it up 1-1 and keep the Indians right in it. Bristol Central had plenty of chances in the game that were denied by goalkeeper Jack DeGirolamo. But late in the second half DeGirolamo and Naranjo collided with each other and were each given cards. Naranjo returned, but DeGirolamo did not. The Indians didn’t have as many chances as the Rams forced Newington to play a different style of game. Bristol Central goalkeeper Danny Gaudoin had a few collisions in the game as well, but kept getting back up and fighting through the physicality Newington brought. The first-year keeper for the Rams finished with nine saves. Coming into the overtime period Bristol Central’s head coach Nate Jandreau wasn’t pleased with what he was seeing, but the final result was a different story. Posted in Newington Town Crier, Newington on Wednesday, 17 October 2018 21:56. Updated: Wednesday, 17 October 2018 21:59.